Sign Supplies Are Shipped By The Thousands From Our Fully Stocked Warehouse! 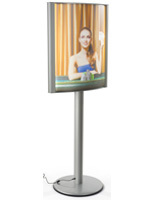 Black Framed Sign Supplies That Display Translucent Posters Will Attract and Inform Customers and Visitors! 22" x 28" 24" x 36" 27" x 41"
LED technology maintains luminosity for over 11 years of steady use! The professional sign supplies with floor-standing bases have a clip-open framing that means adding and changing out signs is quite simple. 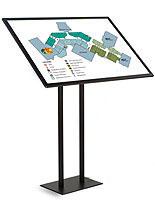 The display's edging just flips open, permitting you to slide your map or directory in position. We also send your sign supplies with a see-through lens to cover and shelter your images. These LED exhibits, sign supplies evenly disperse illumination across your translucent graphic by utilizing its engraved diffusion pattern. 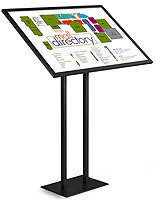 These well lit directory racks are dependable and energy-efficient sign supplies thanks to LED illumination bulb technology and slender designs. These sign supplies, also known as free-standing picture holders or LED frames, can help produce a more impressive display! 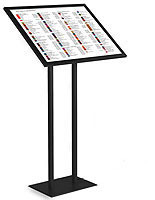 These sign supplies are an ideal directory exhibit to be utilized in any interior setting. The backlit illumination box, sign supplies display translucent, 24"w x 18"h signs brilliantly, consequently drawing more awareness to your eatery or shop and giving your images a clearer display. 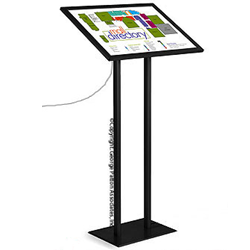 These stylish sign supplies with LEDs, also recognized as LED directory racks, have a matte black finish that meshes nicely with any publicizing exhibit. The neutral color will also focus awareness on your exhibited images rather than distract from them. 18.0" x 52.0" x 11.5"